Kazakhstan was still a part of the Soviet Union when Dr. Teljan Jounisbekov started his medical career. His expertise gave him the opportunity to serve in Burundi as part of the Soviet Union’s international aid programme for Africa. His passion for volunteerism, outstanding dedication and commitment, coupled to his skills and unique attitude, helped save many lives. It was this dedication that turned Dr. Teljan into Kazakhstan’s first international UN Volunteer. The Soviet Union’s programme of aid to Africa, closed after the dissolution of the USSR, was recognised for sending talented professionals abroad. As the programme’s activities gradually came to an end, many professionals returned home to their families. 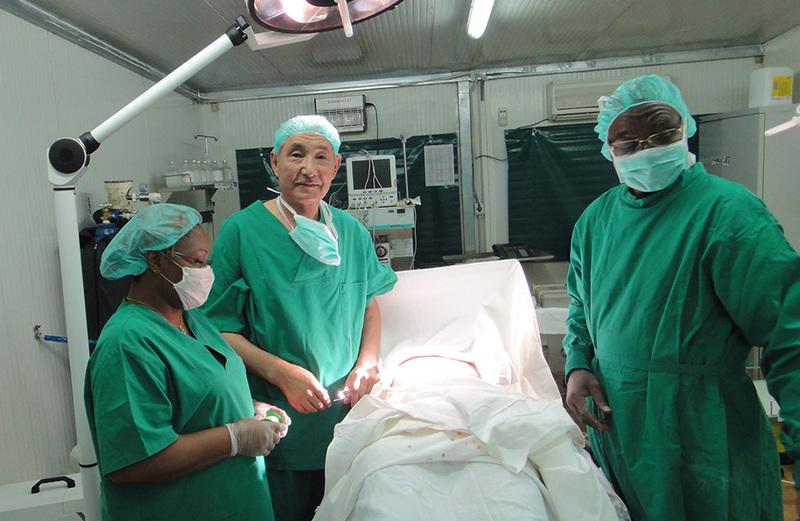 Dr. Teljan Jounisbekov, however, felt the need to continue serving the people of Burundi. He opted to remain in the country and pursue his passion, a decision that was valued by the Ministry of Health of Burundi and supported by the offer of an extension of his contract. Dr. Teljan was now set to remain in the field, where he knew he was needed most. It was while working at the military hospital that he learned of UNV and discovered that there existed opportunities to serve as a UN Volunteer in the country. He was now working for Burundi’s Ministry of External Relations, who had awarded Dr. Teljan a contract due to his valuable skills and outstanding reputation. One day, he was called-in by the World Health Organization (WHO) to assist in an emergency—WHO medical personnel were deployed in the field and unable to answer the call. He had been requested to treat one of their staff who needed urgent medical attention. That is when WHO Senior Management noticed the talented doctor. Impressed by the quality of his medical assistance and strong commitment, the WHO requested that Dr. Teljan be included to the list of candidates for an international UN Volunteer position within their team. That is how he became the first international UN Volunteer from Kazakhstan, a role he maintained in Burundi for three years between 1995-98. Encouraged by his experience in Burundi, Dr. Teljan continued his service in Rwanda as a Lecturer at the national University, where he stayed until 2001. The call of UNV was bound to uproot him again when in November of that year, Dr. Teljan was selected for an assignment in the Congo, where he would assist during an outbreak of malaria. Lack of medical facilities, water, food and medication made that assignment particularly difficult. He served in the Congo for three years under extremely difficult conditions, which helped Dr. Teljan gain valuable experience in tropical medicine. As the UN Volunteer Medical Doctor, he was in charge of treating the sick and assisting entire communities, often working overnight and without pause. His hard work and relentless dedication kept Dr. Teljan in Africa for many more years, also working as a UN staff shortly after his UN Volunteer assignment in the Congo was completed. After retirement, Dr. Teljan decided to continue serving as an international UN Volunteer. Full of energy, passion and commitment to volunteerism, he accepted a new assignment in Ivory Coast. His time in the field ended abruptly when his own health warranted medical evacuation. He was forced to leave his assignment but continued to practice as an international medical professional in less arduous duty stations. Needless to say, Dr. Teljan Jounisbekov dedicated his entire career to serving those who needed him the most, leaving no one behind.